Giant beetle robots, a man who paints with his tongue, a tightrope-walking dog, and a tornado made of fire are just a few of the things readers will find within the pages of the newest book in the Ripley’s Believe It or Not! Curioddities series! Undoubtedly Odd! 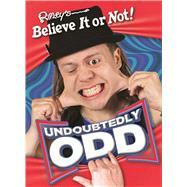 is the newest title in Ripley’s Believe It or Not! Curioddities series, featuring hundreds of pages filled with astonishing stories, interesting people, and stunning photos. Scattered throughout are fun lists, interviews, and reader submissions. This new title is sure to provide a thrill for audiences of all ages and is perfect for reluctant readers. Ripley Publishing, is an arm of Ripley Entertainment Inc., the owner of the internationally famous trademark Ripley's Believe It or Not! as world authority on all that is unbelievable. The company offers up its vast archives of the strange and unusual through books, ebooks, apps, television shows, tourist attractions, motion pictures, merchandise and the worldwide syndication of its daily newspaper cartoon. Ripley researchers across the globe are busy each day digging deep into the world of the odd and bizarre to compile enough fresh an exciting material to fill the Believe It or Not! series of books published each year.